Hambledon suffered damaging and prolonged flooding the winter of 2012/13. This caused major disruption to the community, properties and businesses, the closure of the main roads through the village, and inundation of the foul sewer system. The main cause of flooding in the village is a rise in the level of the groundwater. This causes flooding of cellars, and to some ground floor areas, which leads to pumping out of properties. It also causes surface water flooding and flooding of the foul sewers. What is the aim of the flood alleviation scheme? Improving the discharge of the ditches to the south of the village so that floodwater can be effectively drained away. Hambledon suffered damaging and prolonged flooding last winter. This caused major disruption to the community, properties and businesses, the closure of the main roads through the village, and inundation of the foul sewer system. The village has a long history of groundwater flooding with events, prior to this year, occurring in 2012/2013, 2002/2003, 2000/ 2001, 1994/1995 and in the 1960s. Hampshire’s Local Flood Risk Management Strategy ranks the Hambledon, Droxford and Soberton Ward as being at the highest risk of groundwater flooding. Some of the key issues are listed on the right. A feasibility study was carried out in 2012/13 with the aim of identifying options for flood alleviation measures that would provide the most effective outcomes. The study made an assessment of previous reports on flooding at Hambledon, and consulted with representatives of the Local community, Hampshire County Council, Winchester City Council, Hambledon Parish Council, local Flood Action Group and the Environment Agency. Major flooding events resulting from high ground water conditions. Village placed ‘on hold’ with significant economic and social costs. Lack of capacity in existing small diameter surface water pipe. No alternative flood routing other than the highway. The highway is closed during severe flood events. Infiltration of foul sewers causes sewage flooding and health risks. Pumping of cellars adds to surface water flooding. How will the completed scheme be better for you? Vehicle access for the village remains open during flooding. How will the work take place? Provision of floodwater culverts along East Street, West Street and parts of Green Lane, and re-profiling and resurfacing the highway to enhance carrying capacity. Work will also be undertaken in October and November this year to make sure that the existing road gullies along West Street, East Street and Green Lane are clear. In addition, there will be some localised work to existing highway drainage in East Street to enhance flood resilience this winter. How does the flooding happen? The village is located around the junction of two normally dry valleys. The three main roads through the village, East Street, West Street, and Green Lane, run along the bottom of these valleys. Surface water in Hambledon drains via a winterbourne stream that starts at the north, is piped through the village before emerging at the southern edge of the settlement where it again runs in a stream past Bury Lodge Farm and via World’s End to the River Wallington. 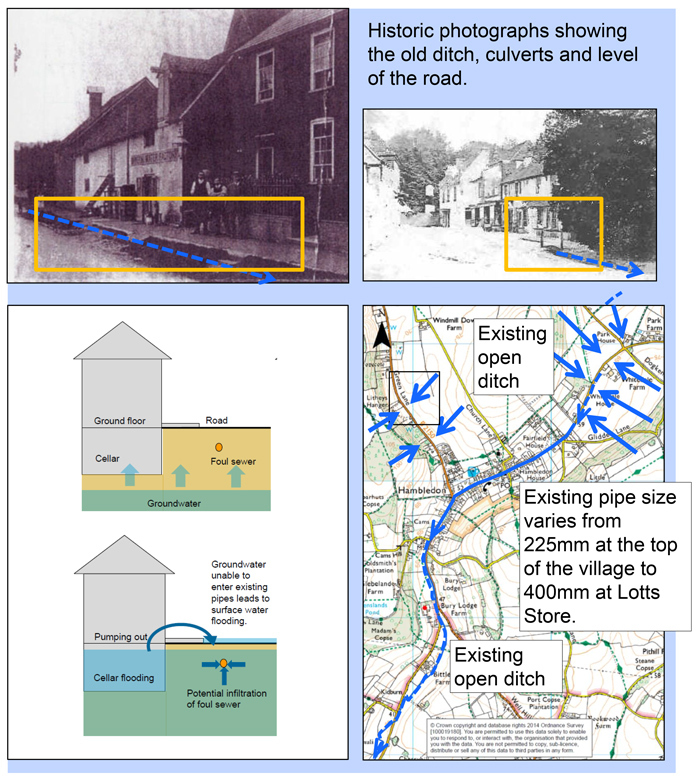 Historically, groundwater and surface water would be carried through the village in a sequence of open ditches and culverts. Over the years the ditch in the centre of the village has been piped and filled in, most notably during the Second World War, when hardstandings were constructed for parking military vehicles. 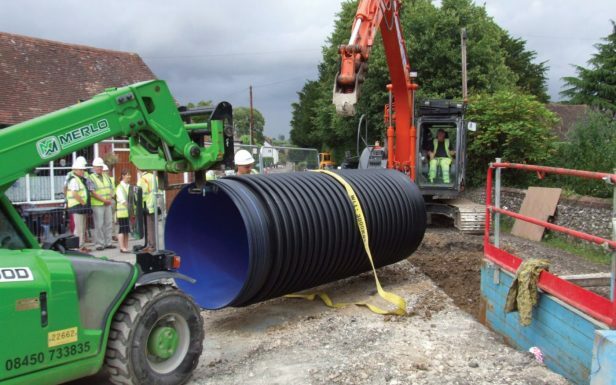 The existing pipe size is able to accommodate significantly less water flow than the old ditch so during a flooding event the roads become the watercourses. It is also reported that the road through the village was, in some places, much lower than it is today. The total cost for the scheme, both Phase 1 and 2, is £4.3m. Of this total, £2.9m has so far been secured by the County Council with contributions from Winchester City Council and central Government. Completion of the full extent of Phase 2 is subject to the availability of further funding from Central Government. An announcement on this is expected in December 2014. Will Phase 2 go ahead if the funding from centraI Government doesn’t become available? Yes. The County Council and its partners are committed to completing as much of the scheme as can be achieved within the funding available. 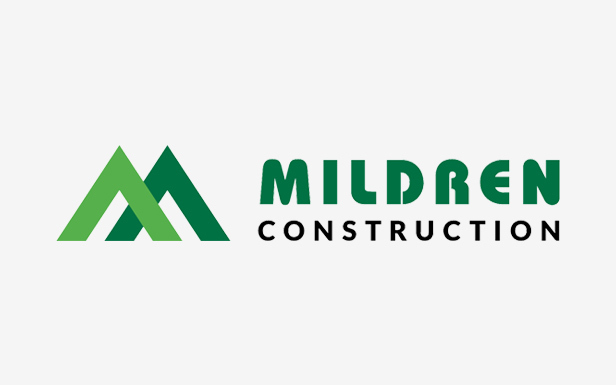 The priority for Phase 2 work will be to connect to the improvements achieved in Phase 1. 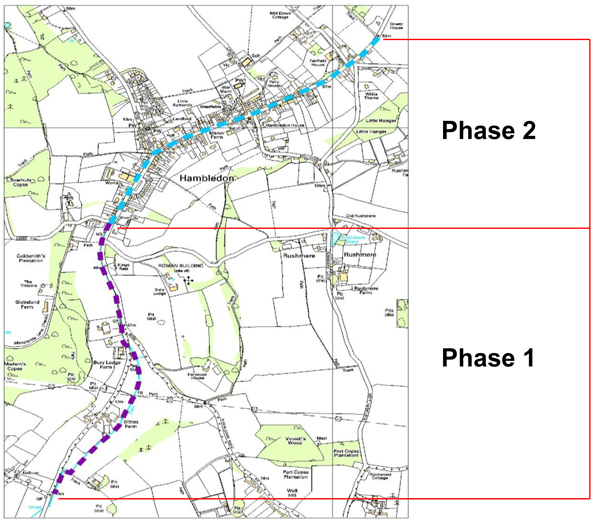 Phase 2 works will therefore extend from Lotts Store northwards.